gives the binomial coefficient . In general, is defined by or suitable limits of this. For integers and certain other special arguments, Binomial automatically evaluates to exact values. Binomial is automatically evaluated symbolically for simple cases; FunctionExpand gives results for other cases. 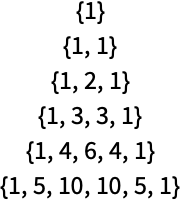 Binomial can be evaluated to arbitrary numerical precision. Binomial automatically threads over lists. For non-negative integers and , the binomial coefficient gives the number of subsets of length contained in the set . This is also the number of distinct ways of picking elements (without replacement and ignoring order) from the first positive integers and for this reason is often voiced as " choose ". The binomial coefficient lies at the heart of the binomial formula, which states that for any non-negative integer , . This interpretation of binomial coefficients is related to the binomial distribution of probability theory, implemented via BinomialDistribution. Another important application is in the combinatorial identity known as Pascal's rule, which relates the binomial coefficient with shifted arguments according to . Expressing factorials as gamma functions generalizes the binomial coefficient to complex and as . Using the symmetry formula for integer and and complex then allows the definition of the binomial coefficient to be extended to negative integer arguments, making it continuous at all integer arguments as well as continuous for all complex arguments except for negative integer and noninteger (in which case it is infinite). This definition for negative and integer , written explicitly as is in agreement with both the binomial theorem and most combinatorial identities (with a few special exceptions). Binomial coefficients are generalized by multinomial coefficients. Multinomial returns the multinomial coefficient (n;n1,…,nk) of given numbers n1,…,nk summing to , where . The binomial coefficient is the multinomial coefficient (n;k,n-k).